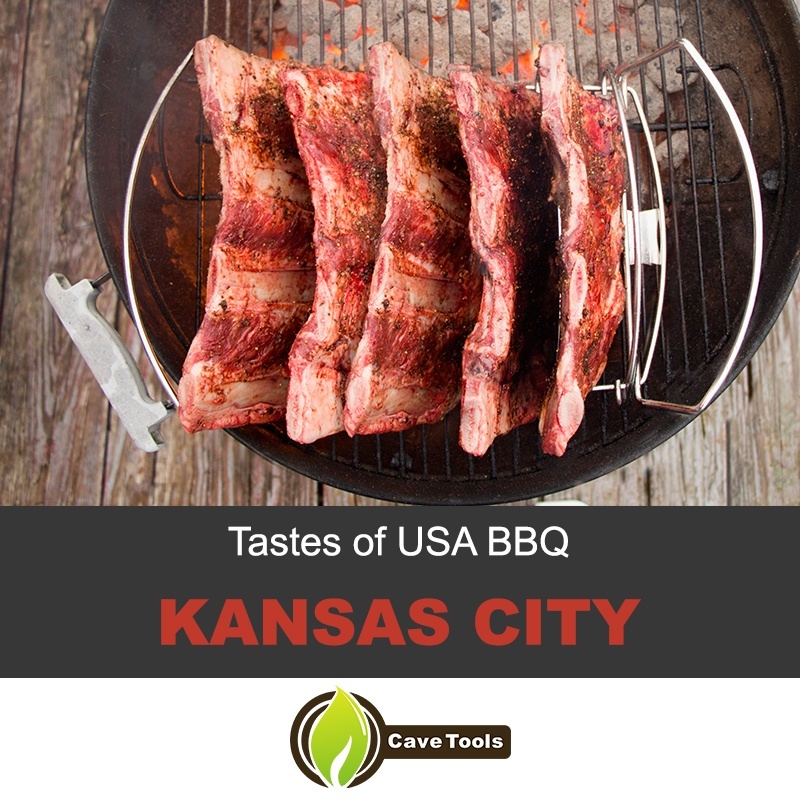 Cave Tools brings you The Tastes of USA BBQ where every other day we are going to take you across the country and show you how barbecue is done differently in notorious barbecue locations. You might have already tried beef ribs, or lamb ribs, short ribs and baby back ribs. Today we go to Kansas City and offer you guides and ideas on how to barbecue like the pit masters do it in Kansas City. Kansas barbecue style entails using a slow cooking method. There are a variety of meats that Kansas City barbecues with rather than one well-known type of barbecued meat. 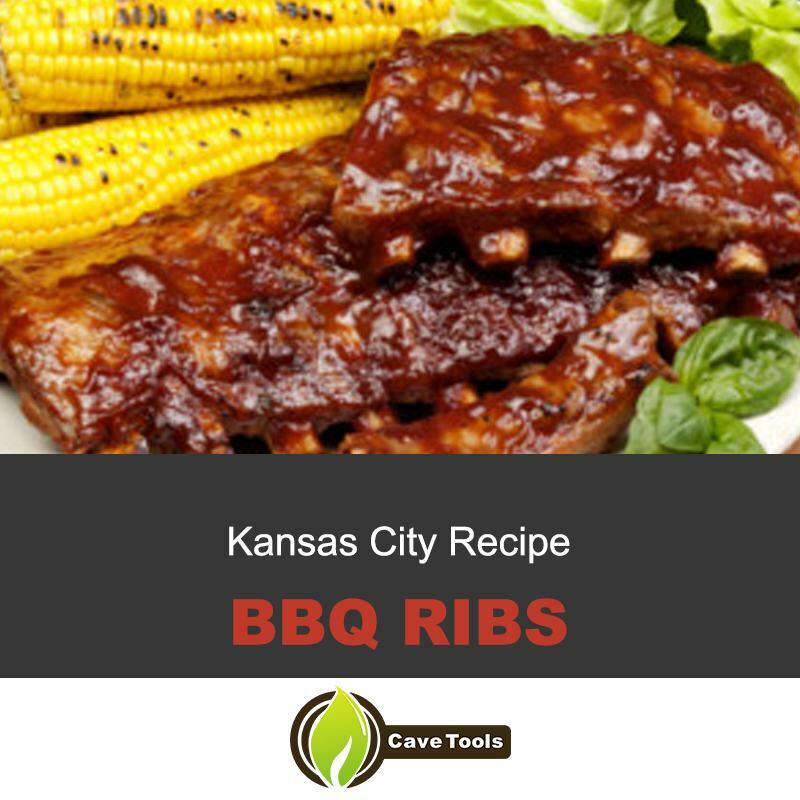 Additionally, Kansas City’s BBQ sauce is a different special taste and we will provide Kansas City BBQ recipes on how to make this delicious tangy flavor! Get your pencil and paper ready because these notes will make you become a Kansas City BBQ master so you can make food worthy of true barbecue restaurants! Distribute vegetable oil evenly in a saucepan and place over a medium heated stove top. Combine garlic, tomato paste, chili powder, allspice and salt/pepper/paprika and stir for 5 minutes. Add the rest of the ingredients listed above and adjust your heat so there is a consistent simmer, and continue to cook for 35 more minutes. Make sure to remove the basil leaf before consuming the sauce. In a bowl, mix the brown sugar and seasonings listed above. Remove the thin white piece of membrane off of the bone area of the rib portions. Add the rub to the ribs by using a massaging motion to really sink in the flavors and let the seasoning sit for at least an hour. Before cooking, mix the ribs with the Kansas City style BBQ sauce. Slow cooking the ribs is key, so cook the pork ribs meat side down on a roasting pan. Heat the oven to 350 degrees F and cook the ribs for two and a half to three hours until the meat is so tender it can be easily pierced by a fork. Remember to reapply sauce to the ribs every 30 minutes. Step 1 – For an amazing seasoning, mix brown sugar, paprika, salt, pepper, chili powder, garlic powder, onion powder and cayenne pepper (use a tablespoon of each). Step 2 – Cut a two pound pork shoulder in large cubes and mix them around in the seasoning bowl. Step 3 – Add three cups of water to the pork shoulder pieces in a pot. Bring water to a boil and adjust the heat so the water is at a constant simmer. Slow cook the pork for 2 hours. 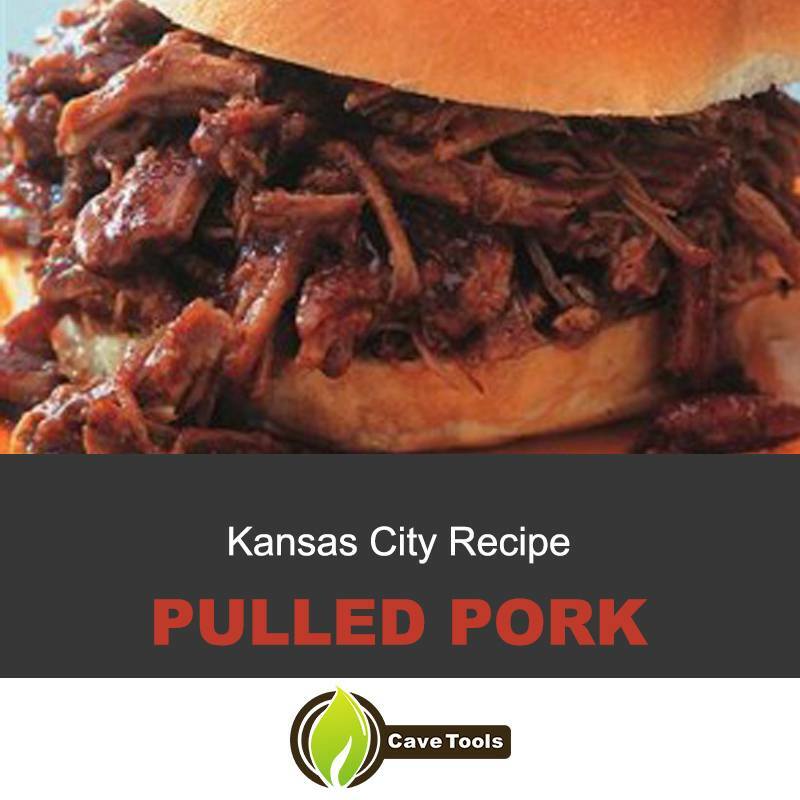 Step 4 – Shred pork by separating the meat with two forks and pull away or use our new Cave Tools shredding tool. Step 5 – Mix pork with Kansas City style BBQ sauce and put the meat on a toasted bun with some pickles and coleslaw for condiments. Hopefully this guide will inspire to make the best barbecue you’ve ever tasted, a Kansas City barbecue. Add some side dishes to your pork ribs, and you’ll get the best bbq to surprise your friends and family! Keep a look out for our next coverage on Texas Style BBQ! What defines Kansas City Barbecue? The thing that Kansas City is most well-known for is burnt ends. These are the crispy ends of a smoked beef brisket. They’re especially fatty as compared to the other parts of the brisket, and they’re typically more heavily spiced than the other pieces, too. There are only a few pieces that qualify as burnt ends on each brisket, so they're in high demand! How do you make Kansas City BBQ sauce? For step-by-step instructions of how to make Kansas City BBQ sauce, check out the article above! We include all the ingredients and proportions, as well as how long to cook them. In general, Kansas City BBQ sauce is super thick, sweet, and has a full-on tomato flavor. What are the popular side dishes in Kansas City BBQ? Kansas City might be best known for burnt ends, but for some people, it’s all about the side dishes! They make a very unique style of baked beans, and you’ll also find other Southern favorites like coleslaw and potato salad. French fries and other fried foods (like okra) are also very popular at a Kansas City barbecue. How do you cook Kansas City style ribs? Kansas City ribs are well-known for having a sticky, thick sauce. The ribs are usually dry rubbed and the sauce is typically brushed on in the last 30 minutes of cooking. That causes it to glaze onto the meat. We have a recipe above for this style of ribs. This meal will be pretty messy, but I promise you it’ll be super delicious! What is in a Kansas City style rub? Most Kansas City rubs have similar ingredients, including brown sugar, salt and pepper, garlic and onion powders, cayenne, and paprika. What makes this rub stand out is the addition of mustard powder.